From what I’ve been hearing, Microsoft might have been planning to allow insiders to get the final version of Windows 10 for free, but as time passes it appears that they’re starting to think that doing that might be a bad idea. After their first announcement that Windows 10 would be free to Microsoft Insiders (Beta Testers) They seem to be reversing course and saying that you’ll need a valid Windows 7/8.1 license. Of course this isn’t a surprise to me. I got into the Windows 7 and 8 Betas and at the end of each I needed to get a full version of the OS before I could keep on using the computer. (Also it required a full install, erasing everything on the machine) Now I’m prepairing for the full release of Windows 10, I currently have two machines running the Tech Preview, they will probably get reset to their original versions of Windows before too long. 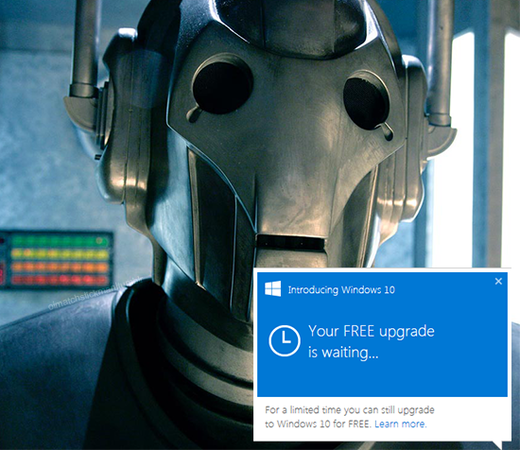 It is interesting seeing that Microsoft is planning to allow Windows 7 and 8.1 users to upgrade for free at any time during the first year though. Also on a side note, I really hope that Microsoft returns window border customization. The pure white windows are really starting to hurt my eyes. If I could customize the system more, I’d be so happy. The new Oculus Rift has been revealed! I’m happy to see that the Oculus Rift will soon be released to the general public, sadly they put Mac and Linux support ‘on hold’, which means that Windows will be a requirement to use the Rift. From some of the articles that I’ve been reading, thanks to a partnership with Microsoft (Which is probably the primary reason that Mac/Linux support was put on hold) the Oculus will be natively supported on Windows 10, and it’ll be possible to play XBox games on it. In the end, I’ve become partial to the HTC Vive headset, it will have similar specs to the Oculus, but is being made with a partnership between HTC and Valve. I think that Valve will want the Vive to work on their Steam Machines, which hopefully will mean Linux support. A game that I’ve been having quite a bit of fun with has had a major update, it does break some things, but for the most part, the new features are very nice. The biggest new feature is tunnels, which I haven’t seen in a city sim since Sim City 4. This is very nice, since tunnelled roads appear to work in the same way as surface roads or bridges (except without those blasted support pillars) allowing you to hide some of the messes that can come up as you upgrade the roads throughout your city. They also added an European map theme which allows you to have more interesting looking cities. Overall it’s a very nice update, it fixes many bugs, such as ships glitching over land, and adds a few new features. If you want more information about the update, Click Here.